Well, I am aware of the inequalities between men and women, am 20 years old, and I call myself a feminist. Apparently Female Impersonator and the rest of the lively young femnist blogosphere escaped their attention. It is really annoying that myself and so many other young women are feminist activists online and outside cyberspace but have yet to be recognized by the 2nd wave feminists that we admire so much. That being said, I acknowledge the frustration over some (but nearly as many as was implied by Gail and Stacy) young women my age who are feminists, do feminist work, but refuse the name. One of my friends once told me that she didn't want to identify as a feminist because she didn't want to associate with anything like a political party. So yes, misunderstandings about feminism exist in my generation. However, I don't think it is fair to point this out without acknowledging how many young women do identify as feminists and how many young feminists are working to end all those misunderstandings about it. The purpose of Jessica Valenti's book Full Frontal Feminism was to erase any bad connotations with the feminist movement that other young women might have. So anyway, in response to this article, Shelly B has called for young women to post the link to their feminist blog in the comments section of her blog post and to include the above image on their blog. If nothing else, the comments on her post have given me a great list of new blogs to take a look at. We encourage you to include your feminist blog on her site, but also in the comments of this post. We want to know what you're writing! 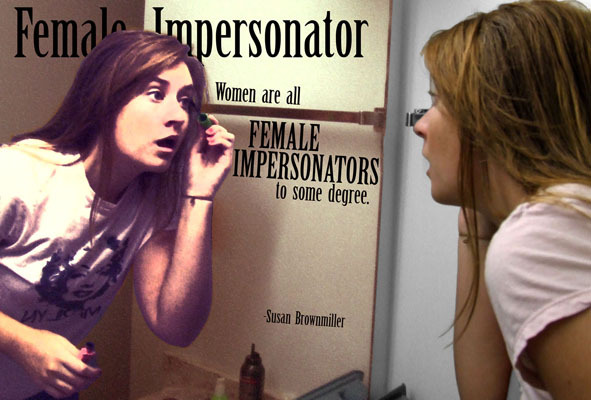 There's nothing "feminist" about Jessica Valenti. Most of the actual feminists I know cannot stand her, nor her pop-culture-changes-with-the-moon-clique feminism. This is a woman who spent a few years ranting against marriage and childrearing, then got married and had a child. The same that encourages cliques on her site, pushes out new blood, keeps the status quo of only the chosen few being allowed to comment (no matter how offensive they are), and allows offensive-as-hell articles to be posted. She's no feminist. She's a grandstander who wants to co-opt the movement to line her pockets with green. Great post. 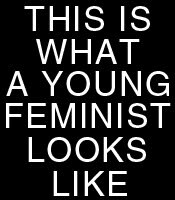 I hear all the time that young people aren't feminists and it is manifestly not true. I was a little uncomfortable that the post doesn't mention young male feminists. As a young man who considers himself a feminist I know that we are perceived to be an even smaller minority. I know we weren't excluded from this post on purpose, but I did want to point it out anyway. On Valenti: I'm not a big fan of her. I feel as if I grew out of her brand of feminism about 6 months after I took my first Gender and Women's Studies class (back in 2007). While I am not much interested in her work anymore, it does not mean that what she does is not properly feminist or that she should be discounted. Her work did a lot to bring me into the feminist movement, and I believe the same is true for a lot of young people. It's important to have something/someone who grabs attention to progressive work, and I think that is exactly the purpose Valenti serves (no matter how limited or privileged I might feel her focus to be). So good for her. Anonymous- I really like Jessica Valenti. I understand that her life or blog does not represent all feminists but I don't think that means she isn't a feminist. On the other hand, I am not really familiar with your critiques, either. I understand Amelia's point about her focus being somewhat priveledged at times, but don't remember her talking against childbearing or marriage. I am not saying you are wrong (I certainly have not read everything she has ever written), but I would be interested to see what examples you have. I want to be fully informed before I go promoting someone! Sam- You have my deepest apologies. As someone who constantly argues that there are men in the feminist movement and enourages more men to identify themselves as feminists, I should have been more careful. I will be better about my gendered language and will be more inclusive in the future. To back you up, Victoria, I had a similar feeling about Anon's critiques of Valenti - while I am not her biggest fan, I am completely unaware of where Anon is coming from. Whether we like her or not, Valenti has done a lot to draw young people into the feminist movement and make it ok to identify as feminist, and that deserves credit. I don't know if this will make folks feel any better, but very similar things were being said about twenty years ago when I first started taking women's studies courses. A lot of people didn't like the term feminist even thought they embraced many of the more basic values associated with the term. There was also a growing generation gap between 2nd wave feminists and younger feminists. Same themes, different decade. Pretty much any group of people who challenge the cherished status quo is going be labeled as villainous. It comes with the territory. The term feminst hasn't been rehabilitated in over 20 years and I doubt that it will be because challenging the gender status quo pisses off a lot of people. It forces people to question things they'd rather not question and those questions concern very personal matters: how they identify as women and men, how they conduct themselves with others, how their most intimate relationships play out, and so much more. That's big, scary stuff for so many people. It may be a simple maxim, but such fear and discomfort tends to inspire anger and backlash.